A short post today, but certainly not one lacking in importance. 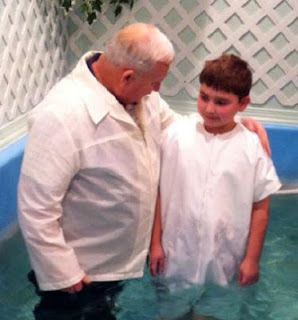 My sweet son, Jack, was baptized by my dad yesterday. I can't even begin to put into words the joy that fills my soul. Many times I have heard my dad quote, Proverbs 22:6. "Train a child in the way he should go, and when he is old he will not turn from it". Father God, thank you for the gift of Godly parents. And, thank you for the joy of being a mother. Please watch over my sweet babies. Hold them in Your hands and keep them safe. May they grow to be mighty men of God and faithfully serve You as they travel the many roads in their lives. *Certainly, parents aren't the only ones with influence in children's lives. Grandparents, in particular, have had a very strong influence in my life and in the lives of my own children (see photo above!). People of influence are all around each and every one of us, and they need not be blood relation to share the love of Christ with our children. May each of us be blessed to have people in our lives who share, or have shared, the greatest gift of love with us.